The Palace of Europe in Strasbourg is going through tough times. Set up to reinforce democratic standards and humanistic principles on the continent, the organization is preparing to revise its fundamental principles and make it much more difficult to apply sanctions against big countries represented by big delegations. Punishing smaller countries will be easier. All this will happen if 67% of votes approve the proposalon reconsideration of credentials and participation rights of national delegations at the fall session this month. The four pages of the document mention no countries. Still, all those involved know well that it has been drafted to Russia’s rune which, while remaining a member of the CoE formally, has not been paying its membership fees for over a year and has not been sending its delegates to work at the CoE Parliamentary Assembly. In 2014, right after the annexation of Crimea and the start of the war in the Donbas, the CoE was the first international organization to pass sanctions against Russia. The Russian delegation was then stripped of its right to vote on resolutions and recommendations, then to participate in the CoE’s missions and work in its governing bodies. The restrictions infuriated Russia, so it decided to stop sending its representatives to Strasbourg. The Kremlin has no intention to fulfill the demands of the CoE and other international entities about returning Crimea to Ukraine and stopping the war in the occupied territory. What’s next? Russia could accept the status quo and live with the sanctions, its one foot in the CoE and another beyond it, or to try and turn the table through blackmail, and change the rules to fit its interests with force and manipulations. Clearly, Moscow opted for the latter. Its emissaries made it clear for the CoE leaders that membership fees will only resume after Russia receives all of its rights back with no concessions from its side. How could this be done? One way is to change the system of voting on sanctions from the majority of votes (as it is now) to 2/3 of those present (as stated in the document that will be discussed in the session hall on October 9). According to The Ukrainian Week’s sources, pro-Russian forces in the CoE are also hoping to make the procedure for initiating sanctions more complex. As a result, punishing Moldova would be easier, while punishing Turkey or Russia would be virtually unrealistic. The CoE thus risks turning into a territory of secondary discussions without any influence on big politics. How good are the chances that the new procedure will be approved? Volodymyr Ariev, head of the Ukrainian delegation and PACE Vice-President, believes that the chances are 50:50. The first supporter of bringing Russia and its membership fees back is CoE Secretary General Thorbjorn Jaglan. His tenure is running out, but he is doing his best to benefit the Kremlin before he leaves. Secretary-General Jagland has been lobbying for the removal of sanctions against Russia for almost a year now, not put off by the fact that Russia has complied with none of the conditions for which the sanctions had been imposed in the first place. In his many interviews, Jagland is urging everyone to ponder the fulfillment of Russia’s demands. As if it was unjustly offended, and not an offender creating bloodshed in the neighboring country. 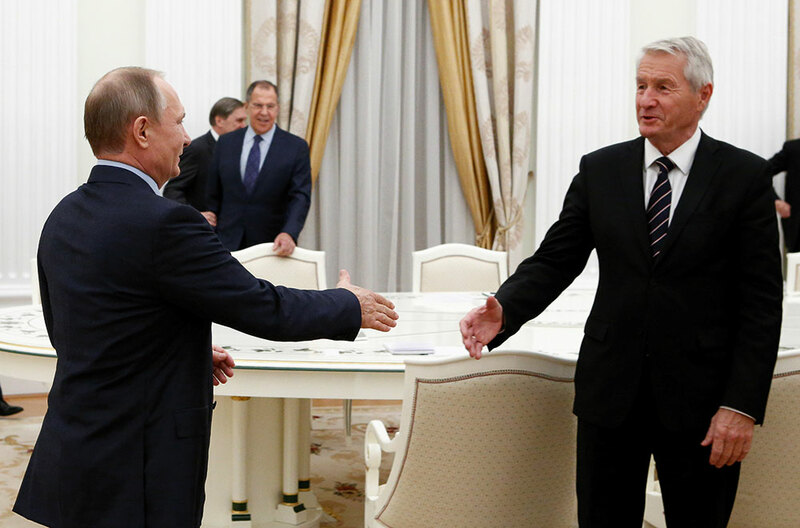 Jagland has spent over a year touring European capitals and persuading politicians involved in PACE’s work that it can’t allow Russia to leave the CoE. He refers to the interests of common Russian citizens who will thus lose the opportunity to appeal to the European Court of Human Rights, one of the CoE’s entities. The fact that Moscow de facto declared itself out of the Court’s jurisdiction and refused to fulfill the Court’s verdict after it ruled in favor of Mikhail Khodorkovsky (based on the ECHR’s verdict, Russia had to pay €1.9bn to the former shareholders of YUKOS, an oil company he used to own) does not seem to bother Secretary-General Jagland. The CoE is not a structure that an average European sees or understands very well. Not everyone in the EU is watching the developments in Strasbourg. By openly pushing for Russia’s interests, the Norwegian Labor politician who has chaired the CoE since 2009 leaves many questioning whether he still cares more about the fundamental principles of the organization, or the financial aspects of its work. The crisis faced by the CoE for years now goes beyond the money dimension. It has revealed the crisis of the values which the CoE was initially set up in 1949 to protect. According to The Ukrainian Week’s sources, Poland, the UK, Sweden, Georgia and MPs from the Baltic States may vote against the change of the procedure to allow Russia to return to PACE without deoccupying Crimea and the Donbas. Will these votes be enough to stop the attempt to turn the CoE into an organization that exists for the mere purpose of existence? The arguments used by the supporters of Russia’s unconditional comeback include the risk that Russia, as well as Turkey which has similar problems with authoritarianism, will leave the CoE. “This means that the CoE will turn into a pale shade of the EU without its powers,” a former member of the French delegation commented for The Ukrainian Week. However, the CoE had existed long before 1996 when Russia joined it; the ECHR had been delivering its verdicts, while European countries had been harmonizing their legislations, and all that work had made sense. Russia is pushing medieval approaches, rude force and the law of the jungle, as well as rejection of the rule of law which the CoE is aimed to protect. Many in the West pretend not to see what’s going on and what consequences this will bring. In this situation, Ukraine is forcing the Western political establishment to go through an unpleasant exercise and decide between money and principles, a moral imperative and spin-doctoring. Andreas Gross: "Ukraine is already under authoritarian rule"